Treat mom to a culinary celebration with the whole family at The Hive’s Mother’s Day Brunch. 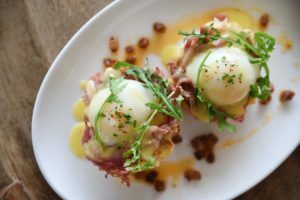 Executive chef Matthew McClure is preparing all your brunch favorites, rich with local flavor. The three-course prix fixe menu is $36 per adult; $18 per child. Family in town for the holiday? Send them to stay at 21c Bentonville. Next: Fork + Bottle Dinner: BBQ and J. Rieger & Co.